Vespasian (left) and his son Titus (right) both served as Roman generals in the war of AD 66-70 that left Jerusalem in ruins, and both went on to become emperors. 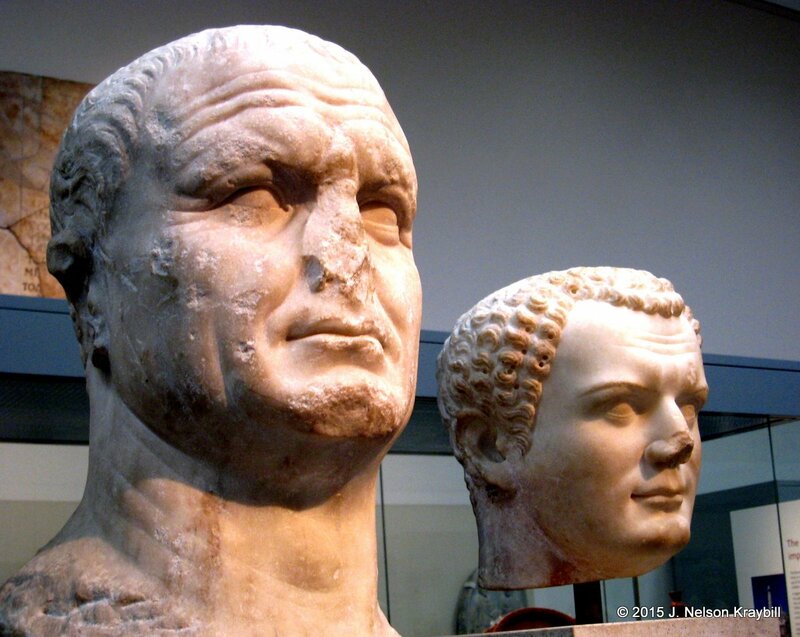 Examine the faces of these two Romans: Vespasian and his son Titus. Together they commanded armies that annihilated Jerusalem a generation after Jesus’ ministry. Jesus knew what they would do, and yearned to head off the catastrophe. Jesus wept over Jerusalem from the Mount of Olives at the beginning of Passover week. Shortly he would enter the holy city with crowds shouting “hosanna!” But grief welled up because Jesus saw disaster ahead for a misguided and polarized people. Some—such as the Herod dynasty and Sadducees who ran the temple—unscrupulously collaborated with the occupying Roman power. Others were bent on armed revolt against Rome. If only you recognized the things that make for peace! Things that make for peace abound in the ministry of Jesus: do good to those who hate, carry a Roman soldier’s pack the extra mile, heal a centurion’s servant, refuse to lord it over others, cross ethnic boundaries to show compassion, forgive enemies, speak truth. Such peacemaking grows out of deep spiritual roots. Jesus’ first public act after the triumphal entry was to liberate the temple from dishonest money changers, declaring, “My house shall be called a house of prayer for all the nations, but you have made it a den of robbers” (Mark 11:17). Prayer forms the center; all nations shows the reach of his love. A generation later, Jewish rebels succeeded in ousting Roman forces—and then the empire struck back. General Vespasian commanded Roman legions seeking to reconquer Palestine. When Vespasian left Judea for Italy to become emperor in AD 69, Titus took over to finish the brutal task. As always, Rome was ruthless against those who challenged its sovereignty. Jesus saw disaster coming for Jerusalem: “Your enemies will set up ramparts around you and surround you, and hem you in on every side,” he said. “They will crush you to the ground, you and your children within you, and they will not leave within you one stone upon another; because you did not recognize the time of your visitation from God” (Luke 19:43–44). Jesus told his followers not to support the imminent revolt: “When you see Jerusalem surrounded by armies, then . . . those in Judea must flee to the mountains, and those inside the city must leave it. . .” (Luke 21:20-21). As war started in AD 66, Christians at Jerusalem in fact decamped to Pella in what today is Jordan. War always is hell, but the final siege of Jerusalem is beyond imagining. Four Roman legions surrounded the city, with the Tenth Legion on the Mount of Olives where Jesus had wept (see more on the Tenth Legion at https://peace-pilgrim.com/2015/03/09/to-hell-with-the-pigs/). Thousands trapped in the city starved, and some turned to cannibalism. Civil war erupted within Jerusalem between rebel factions, while delirious revolutionaries predicted apocalyptic deliverance. To demoralize defenders of Jerusalem, General Titus crucified so many Jewish prisoners of war outside the city wall that “space could not be found for the crosses and for the bodies” (Josephus, War 3:341). When the city fell, the temple was in ashes and tens of thousands of Jews either were crucified or sold into slavery. This entry was posted in Uncategorized and tagged Jewish War, love of enemies by nelsonkraybill. Bookmark the permalink. The Roman church, which was able to prosper because of these men’s actions and later under Constantine, did much more harm to the Jews. Many, many things were done in the name of the Roman church to destroy any connection between Judaism, even Jewish believers in Jesus, and the church. Jews were not allowed to meet, Sabbath keeping was made illegal, the day people met was changed to SUNday, they said, because Jesus rose that day, but really Romans worshipped the SUN. Then they met to invent the trinity doctrine discussing about Jesus’ nature and came up with the idea that he must be G-d, when nowhere in Hebrew scriptures (which is all they had) does it say that the Messiah had to be god. They KNEW Jews could not accept this doctrine and never would, forever driving a wedge between Jew and Christian. Then they murdered, during a time, everyone they could find that was Jewish. It is no wonder Jews cannot accept Jesus as Messiah. The church of Rome made sure they couldn’t with their divisive doctrines, creeds and actions. They played right into Satan’s wishes to keep the Messiah from returning. Today, the whole Christian church blindly accepts and defends these actions and beliefs though they are hypocritical at their core: Jesus the Jewish messiah is wonderful but the Jewish people he loved, died for and was one of are hated. No dialogue exists between Christian and Jew that seeks to find common ground, offer apologies, build trust, understanding or co-operation. This mistrust goes way back to the church of Rome and continues to this day. Pope Francis recently called Mahmood Abbas an “angel of peace” when his rhetoric is decidedly opposite. No such statement has been made by Rome about the IDF which seeks to KEEP the peace, even while being constantly attacked. But those who are NOT part of the Roman church, who were from the reform church movement, continue to blindly follow it without a thought to how Jew and Christian could be brought together. Forget Rome. We should help change things so the Messiah will come by removing everything that stands in the way of the Jews accepting Jesus as Messiah. Maranatha!